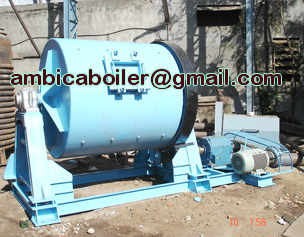 ball mill consists of a hollow cylindrical shell rotating about its axis. The axis of the shell may be either horizontal or at a small angle to the horizontal. It is partially filled with balls. The grinding media is the balls, which may be made of steel (chrome steel), stainless steel, ceramic, or rubber. The inner surface of the cylindrical shell is usually lined with an abrasion-resistant material such as manganese steel or rubber. Less wear takes place in rubber lined mills. The length of the mill is approximately equal to its diameter. In case of continuously operated ball mill, the material to be ground is fed from the left through 60° cone and the product is discharged through a 30° cone to the right. As the shell rotates, the balls are lifted up on the rising side of the shell and then they cascade down (or drop down on to the feed), from near the top of the shell. In doing so, the solid particles in between the balls and ground are reduced in size by impact. A ball mill, a type of grinder, is a cylindrical device used in grinding (or mixing) materials like ores, chemicals, ceramic raw materials and paints. Ball mills rotate around a horizontal axis, partially filled with the material to be ground plus the grinding medium. Different materials are used as media, including ceramic balls, flint pebbles and stainless steel balls. An internal cascading effect reduces the material to a fine powder. We are a prominent organization engaged in manufacturing and supplying Ball Grinding Mill . Ball Grinding Mill are most suitable to grind even the hardest rock with uniform fineness up to 300 mesh with minimum ware & tear. For jerk free rotation the entire shell is balanced charging / discharging door is designed. Prince is making rotary screens also in different diameters, length and segments driven through central shaft with crown & pinion gear to prevent flying dust covers may be provided as an option. However, for wet grinding and mixing light duty ball mill are also available as an option, inner may be provided either of CI, MS, SS, Mn Steel, Ceramic or any other suitable material.